Before You Begin: This is an older version of the Magoosh 3 Month Advanced Study Schedule (Version D). You should only use this plan if you started with this study plan before July 2015. If you are just starting to study, please use the most updated version! OK, you are starting more or less from scratch, and you want to prepare for the GMAT in three months. You need a strategic plan to organize yourself. I designed four different versions of the Three Month Plan, and I need you to start with a little self-diagnosis. Which sounds most like you? 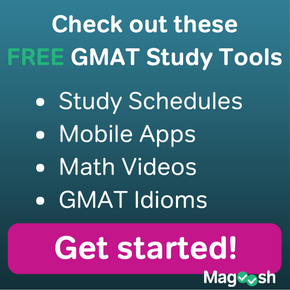 3 Month GMAT Study Schedule for Beginners: Help! Math and verbal both scare the living bejeebers out of me! I need all the help and support I can get! Help! 3 Month GMAT Study Schedule (Math Focused): I have a natural affinity with the verbal, but the math is far less intuitive for me. I would like to focus more there. 3 Month GMAT Study Schedule (Verbal Focused): Me a math nerd. Me think all math easy. Me have big verbal problems. One day, me will talk good. 3 Month GMAT Study Schedule for Advanced Students: I actually feel reasonably comfortable with math & verbal; if I took the test today, I’d get around 600-650. I’m interested in refining my understanding, and getting into the upper 700s region in the next twelve weeks. 2) The code in the back of the OG will give you access to GMAC’s IR website with 50 IR practice questions. 10) a good 1-2 hours a day, for five days a week, and then a good 3-4 stint on the weekend (“Day Six”) — with a day off on the weekend as well. If you would rather free up some week nights, and move some of the material into the other weekend day, you are welcome to do that. Note: Many folks find that each day’s assignments take 1-2 hours, although times to complete them will vary for different students. Notice, this is a twelve-week plan. Three calendar months are typically closer to 13 weeks, so if you actually have three calendar months to prepare, that’s great. If you have a wedding or a camping trip or something in the middle, you could just skip a few days, and do them later. Alternately, it would leave you more time for the concentrated review I recommend at the end of the twelve weeks. Also, as much as possible, get enough sleep during this three month period. REM sleep plays an important role in encoding long term memory, and in an eight hour period of sleep, the last hour has the most REM. If you are getting 7 hours/night instead of 8 hours/night, you are depriving your brain of one of its most powerful systems for learning and remembering. Caffeine and energy drinks will keep you feeling awake if you don’t get enough sleep, but they don’t do bupkis to replace the lost opportunity to encode more information into long term memory. Additional Note: You may find that the number of lessons in this study plan doesn’t correspond exactly to the number of lessons in Magoosh. Don’t worry! You aren’t crazy and you aren’t missing any content. We are in the process of updating the lesson videos in Magoosh to make them better and more streamlined so you can use your time wisely. We will update our study plans soon to reflect the changes in Magoosh. We’ll make it clear when the change is coming so you are not caught off-guard! ? 1) Go to http://www.mba.com/the-gmat/test-structure-and-overview.aspx, and read about the structure of the GMAT. Click on each subsection on that page, to read about the individual sections. 2) Take the Diagnostic Test, found toward the beginning of the OG. Grade it, but you don’t have to read through all the explanations today. If you did not as well as you expected in either math or verbal, you may choose to re-evaluate which version (A, B, C, D) you are following. 1) For the Diagnostic test you took yesterday, go over the explanations. For questions you got right, simply skim the explanation to verify that you go the question right for the right reason. If you got the question wrong, read the explanation carefully, writing in your journal any math/verbal concept you didn’t know or understand, as well as anything about the question type that you didn’t understand. NOTE on Magoosh videos: I am assuming that, since you chose Version D, you already have a strong understanding of math & verbal concepts. I am going to assign very few Magoosh lesson videos in this plan, mostly the strategy videos. If what a video is saying seems obvious to you, just click to the end and listen to the summary to make sure you didn’t miss anything. Also, scan the list of Magoosh videos, and if there are math/verbal ideas that you know you don’t understand as well as you could, watch those videos as well. As you work on questions in Magoosh & the OG, you will gain understanding of your strengths and weaknesses, and that might be a time to dip into some Magoosh videos to shore up specific areas. Whenever you do OG questions, always check your answers right afterwards, and read the explanation of anything you got wrong. 1) In the OG, skim the Math Review, to give yourself a sense of the range of what the GMAT asks on math. If any concepts are rusty or unfamiliar, your next stop should be the relevant Magoosh lesson videos. Whenever you do Magoosh questions, if you get a question wrong, watch the video right then, and take notes in your journal about what concepts tripped you up. 1) Go to http://manhattangmat.com/access.cfm, and register using the code in the back of any of the 10 MGMAT books. This will give you access to the six MGMAT CATs. 2) Take the first full length GMAT CAT on the MGMAT website. Go through the entire solution after you are done, taking notes in your journal on anything you got wrong. That software does not include an AWA question. 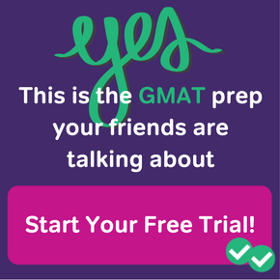 To simulate a full GMAT, begin by selecting randomly a prompt from the back of the OG, and then take 30 minutes to write the essay in a word processing program. This essay you will either share with a trusted friend or mentor, or post in the online forums asking for feedback. Then, take the rest of the GMAT using that software. As much as possible, try to mimic the GMAT conditions. Give yourself relatively short breaks in between sections. Only eat the kinds of snacks that you are planning to bring to the real GMAT. Note how your sleep the night before affects your work. Note how what you had for dinner the previous night and what you had to eat earlier that day affects your energy level and concentration. Write any observations in your journal. Read Volume 0 “The GMAT Roadmap”, Ch. 1-5, taking notes in your journal about what you find significant or helpful. At this point in the schedule, there are no Magoosh videos assigned. Again, these should be your go-to source for a refresher on any point of math/verbal content on which you need more clarity. Starting this week, I will assign reading from the MGMAT books each day. Read Volume 0 “The GMAT Roadmap”, Ch. 6-7, taking notes in your journal about what you find significant or helpful. Skim the first half of Volume 1 “Fractions, Decimals, Percents.” Skim the chapters, and do the “problem sets” at the ends of each section. If you have any issues on the problem sets, go back and read those sections in more detail, taking notes on anything that’s unfamiliar. Read Volume 6 “Critical Reasoning”, Ch. 1-2, and do the problem sets at the end of each section. Take notes in your journal about whatever is unfamiliar. Skim the rest of Volume 1 “Fractions, Decimals, Percents.” Skim the chapters, and do the “problem sets” at the ends of each section. If you have any issues on the problem sets, go back and read those sections in more detail, taking notes on anything that’s unfamiliar. Read Volume 6 “Critical Reasoning”, Ch. 3, and do the problem set at the end of the section. Take notes in your journal about whatever is unfamiliar. 1) Take another full length GMAT CAT on the MGMAT website. Go through the entire solution after you are done, taking notes in your journal on anything you got wrong. Read Volume 6 “Critical Reasoning”, Ch. 4, and do the problem set at the end of the section. Take notes in your journal about whatever is unfamiliar. Skim the first half of Volume 2 “Algebra.” Skim the chapters, and do the “problem sets” at the ends of each section. If you have any issues on the problem sets, go back and read those sections in more detail, taking notes on anything that’s unfamiliar. Read Volume 6 “Critical Reasoning”, Ch. 5, and do the problem set at the end of the section. Take notes in your journal about whatever is unfamiliar. Skim the rest of Volume 2 “Algebra.” Skim the chapters, and do the “problem sets” at the ends of each section. If you have any issues on the problem sets, go back and read those sections in more detail, taking notes on anything that’s unfamiliar. Read Volume 6 “Critical Reasoning”, Ch. 6, and do the problem set at the end of the section. Take notes in your journal about whatever is unfamiliar. Read Volume 6 “Critical Reasoning”, Ch. 7-8, and do the problem sets at the end of each section. Take notes in your journal about whatever is unfamiliar. Skim the first half of Volume 3 “Word Problems.” Skim the chapters, and do the “problem sets” at the ends of each section. If you have any issues on the problem sets, go back and read those sections in more detail, taking notes on anything that’s unfamiliar. Read Volume 7 “Reading Comprehension”, Ch. 1, and do the problem set at the end of the section. Take notes in your journal about whatever is unfamiliar. Skim the rest of Volume 3 “Word Problems.” Skim the chapters, and do the “problem sets” at the ends of each section. If you have any issues on the problem sets, go back and read those sections in more detail, taking notes on anything that’s unfamiliar. Read Volume 7 “Reading Comprehension”, Ch. 2, and do the problem set at the end of the section. Take notes in your journal about whatever is unfamiliar. Read Volume 7 “Reading Comprehension”, Ch. 3, and do the problem set at the end of the section. Take notes in your journal about whatever is unfamiliar. Skim the first half of Volume 4 “Geometry.” Skim the chapters, and do the “problem sets” at the ends of each section. If you have any issues on the problem sets, go back and read those sections in more detail, taking notes on anything that’s unfamiliar. Read Volume 7 “Reading Comprehension”, Ch. 4, and do the problem set at the end of the section. Take notes in your journal about whatever is unfamiliar. Skim the rest of Volume 4 “Geometry.” Skim the chapters, and do the “problem sets” at the ends of each section. If you have any issues on the problem sets, go back and read those sections in more detail, taking notes on anything that’s unfamiliar. Read Volume 7 “Reading Comprehension”, Ch. 5-6, and do the problem set at the end of Chapter 6. Take notes in your journal about whatever is unfamiliar. Read Volume 7 “Reading Comprehension”, Ch. 7, passages A, B, C, & D. Take notes in your journal about whatever is unfamiliar. Skim the first half of Volume 5 “Number Properties.” Skim the chapters, and do the “problem sets” at the ends of each section. If you have any issues on the problem sets, go back and read those sections in more detail, taking notes on anything that’s unfamiliar. Read Volume 7 “Reading Comprehension”, Ch. 7, passages E, F, & G. Take notes in your journal about whatever is unfamiliar. Skim the rest of Volume 5 “Number Properties.” Skim the chapters, and do the “problem sets” at the ends of each section. If you have any issues on the problem sets, go back and read those sections in more detail, taking notes on anything that’s unfamiliar. Read Volume 8 “Sentence Correction”, Ch. 1-2, and do the problem set at the end of the section. Take notes in your journal about whatever is unfamiliar. 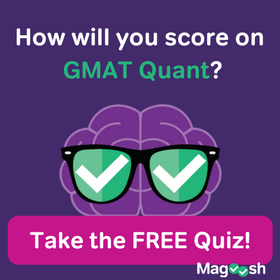 1) Take your last full length GMAT CAT on the MGMAT website. Go through the entire solution after you are done, taking notes in your journal on anything you got wrong. Read Volume 9 “Integrated Reasoning”, Ch. 1. Take notes in your journal about whatever is unfamiliar. Read Volume 8 “Sentence Correction”, Ch. 3-4, and do the problem sets at the end of each section. Take notes in your journal about whatever is unfamiliar. Go to GMAC’s IR practice question website. Your personal hard copy of the OG will contain a code that will give you access to this site. Go to that site, and do the first 12 questions. Set a 30 minute time limit for yourself. Just do each question, and move on. After the 30 minutes are up, go back, check your answers, and read all the explanations. Read Volume 9 “Integrated Reasoning”, Ch. 2. Take notes in your journal about whatever is unfamiliar. Read Volume 8 “Sentence Correction”, Ch. 5-6, and do the problem sets at the end of each section. Take notes in your journal about whatever is unfamiliar. 1) Go to http://www.mba.com/the-gmat/download-free-test-preparation-software.aspx, download the free software. 2) Take one full length GMAT on the GMAC software. Go through the entire solution after you are done, taking notes in your journal on anything you got wrong. Read Volume 9 “Integrated Reasoning”, Ch. 3. Take notes in your journal about whatever is unfamiliar. Read Volume 8 “Sentence Correction”, Ch. 7-8, and do the problem sets at the end of each section. Take notes in your journal about whatever is unfamiliar. Go back to GMAC’s IR practice question website. Reset the answers. Do IR questions #13 – 24. Set a 30 minute time limit for yourself. Just do each question, and move on. After the 30 minutes are up, go back, check your answers, and read all the explanations. Read Volume 9 “Integrated Reasoning”, Ch. 4. Take notes in your journal about whatever is unfamiliar. Read Volume 8 “Sentence Correction”, Ch. 9, and do the problem set at the end of the section. Take notes in your journal about whatever is unfamiliar. 1) Take another full length GMAT on the GMAC software. Go through the entire solution after you are done, taking notes in your journal on anything you got wrong. Read Volume 9 “Integrated Reasoning”, Ch. 5. Take notes in your journal about whatever is unfamiliar. Read Volume 8 “Sentence Correction”, Ch. 10-11, and do the problem sets at the end of each section. Take notes in your journal about whatever is unfamiliar. Reset the answers. Do IR questions #25 – 37. Set a 33 minute time limit for yourself. Just do each question, and move on. After the 33 minutes are up, go back, check your answers, and read all the explanations. Read Volume 0 “GMAT Roadmap”, Ch. 8-9. Take notes in your journal about whatever is unfamiliar. Read Volume 8 “Sentence Correction”, Ch. 12-13, and do the problem sets at the end of each section. Take notes in your journal about whatever is unfamiliar. In this week, you will be finishing up all the questions in Magoosh and all the questions in the OG. You will also finish reading the MGMAT books. Frankly, I am a bit critical of MGMAT’s Ch. 10 here, only because I don’t they don’t say enough or give enough helpful suggestions; see the closing sections of the Magoosh GMAT ebook for my views on this important topic. Review any sections from the MGMAT books or any notes you took on them. Reset the answers. Do IR questions #38 – 50. Set a 33 minute time limit for yourself. Just do each question, and move on. After the 33 minutes are up, go back, check your answers, and read all the explanations. 2) Through selecting question type & difficulty on the “Dashboard”, do Magoosh problems over again, and see how you do a second time. 3) Continue re-reading two chapters each day in the MGMT books, reinforcing whatever topics you need. 4) Go to the online forums, looking for challenging questions that folks are asking. 5) An online search will always turn up additional batches of questions to practice. 6) If you have a weekend day that is more than a couple days before the real GMAT, then take one final practice GMAT, as on the other Day Six’s. 2) Eat a large, healthy, leisurely dinner – no alcohol! 3) Go to bed earlier than usual. 1) ABSOLUTELY NO LAST MINUTE GMAT PREPARATION! 3) On breaks, make sure to get up, move & stretch – moving & stretching the large muscles of the body (legs & torso) will get oxygen flowing throughout, which will help keep you awake and keep you thinking clearly. For relaxation tips, see this post.